*Visitors must present a valid ID. 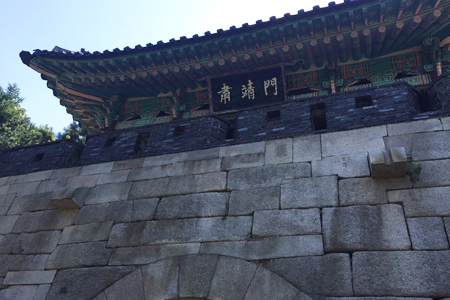 Of the 4 Great Gates(Sukjeongmun, Namdaemun, Dongdaemun, and Seodaemun), established by the Emperor of 1396, Sukjeongmun is called the north gate. 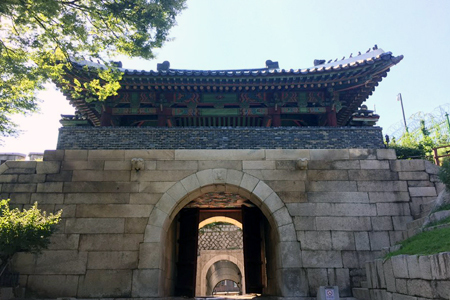 Located to the north of Seoul, this gate, with Gyeongbokgung Palace in the center and Changaemun (Jahamun) to the right, make up the wings of the north gate. Due to the possible danger of the area being damaged from all the pedestrians, the Emperor of 1413 planted pine trees and prohibited passing this area. 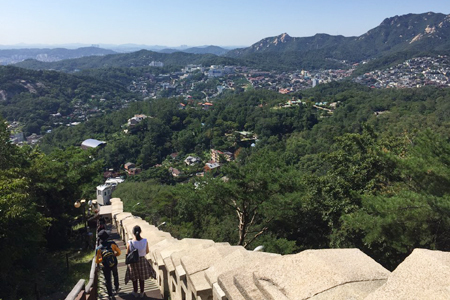 Henceforth, Sukjeongmun became a scenic walkway until the North Korean Communist infiltration of 1968, which prohibited the passing of all civilians. 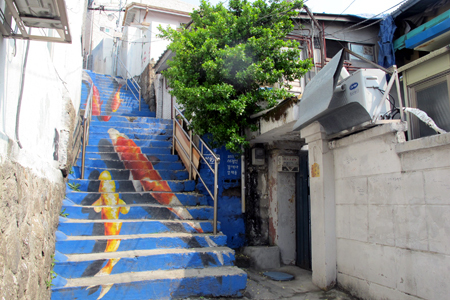 The local Public Art Committee carried out the Naksan Project in 2006 to improve the local environment of Ihwa Village. 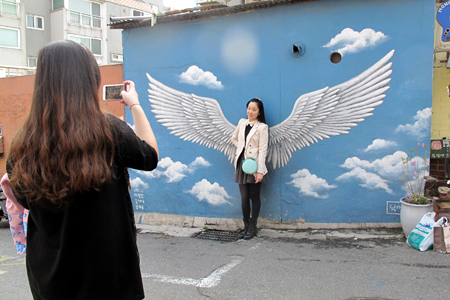 Approximately 60 artists painted walls and installed artworks for the project. Visitors to the village can enjoy looking for and viewing the beautiful murals and sculptures in the village. 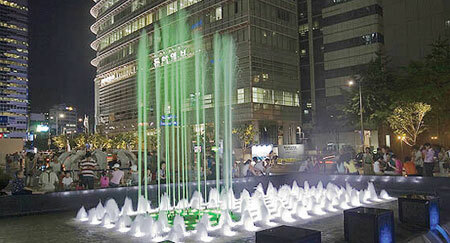 The Cheonggyecheon used to be a naturally formed stream before the Joseon Dynasty designated Seoul as its capital. It was used for women gathered along the stream, bringing a load of clothes to wash and cauldrons to boil the clothes, and children playing in the stream. During the Japanese colonial period, the Cheonggyecheon went through some changes different from those made in the past. the Cheonggyecheon was filled up with trash, ground and sand swept from the bare mountains and severely contaminated with wastes from shabby makeshift houses built alongside. After the Korean War (1950~1953), even more people swarmed into Seoul to find their way and make their living and settled down along the stream. It appeared that the handiest way to put an end to the multitude of shabby, makeshift houses and the dirty smell was to cover up the stream with concrete. 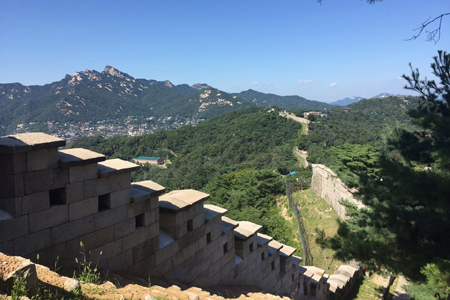 Finally, the work to cover it up with concrete started as quickly as possible by August 1958, with the 136m section near Gwangtonggyo completed in 1955 ahead of the remaining sections. In addition, a 5.6 km-long, 16 m-wide elevated highway extending from Gwanggyo to Majang-dong was completed over the stream in August 1971 after four working years. Thus, all makeshift houses along the stream were demolished, freeing the place for some modern commercial buildings.Then, in the 1980s and 1990s, it came to be regarded as a source of intense traffic, health and environmental issues. 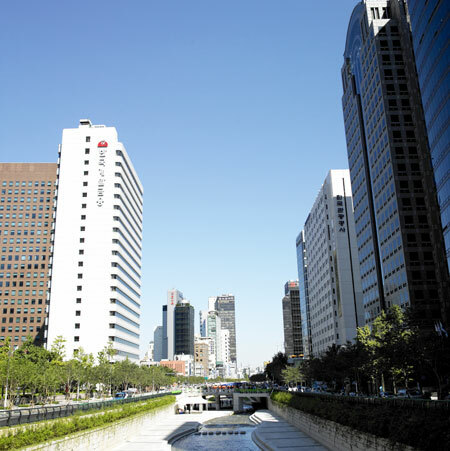 Finaly, Seoul city dicided for recover the stream and now it becomes an oasis of the city, Seoul.